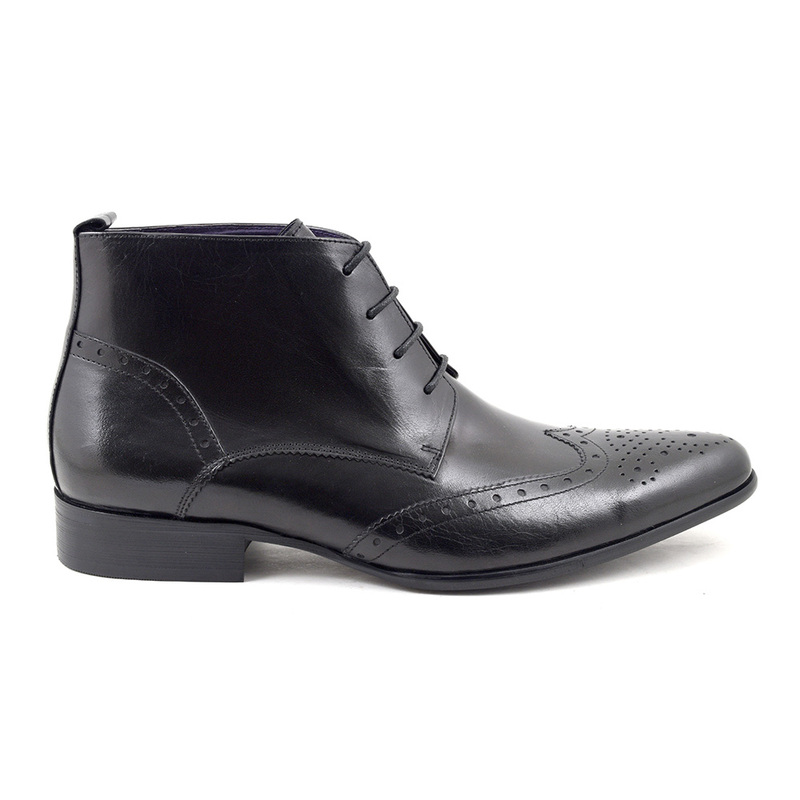 Highly polished black brogue lace-up boot which has a wing tip and brogue detail to a slightly pointed toe. A boot that can be worn dressed up or down. Stylish and modern, you will look dapper. 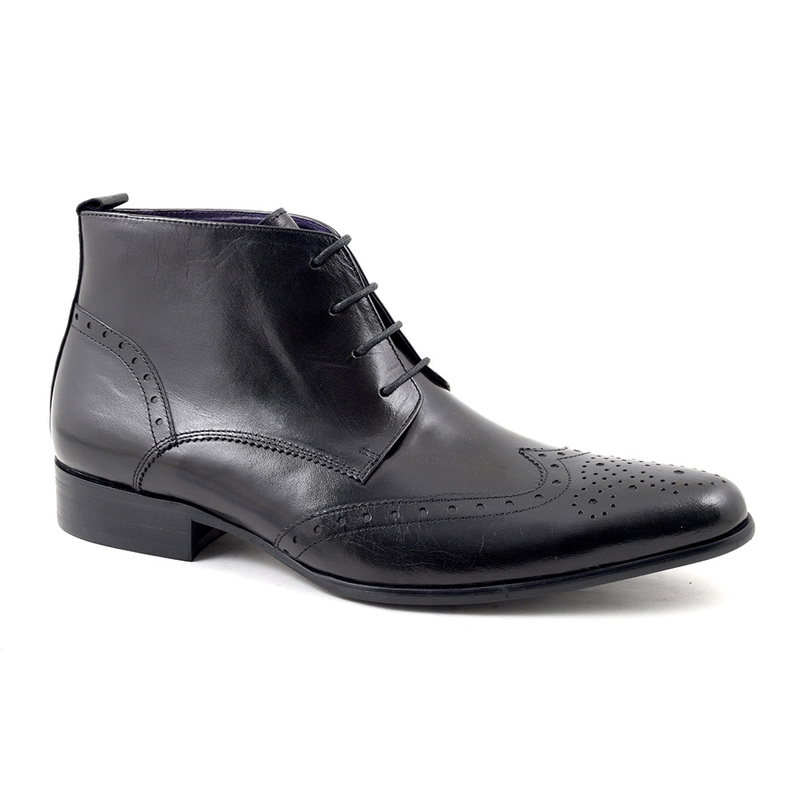 This mens black brogue lace-up boot has a lovely formal(ish) vibe to it and would look just fine in a work situation or in a casual one. 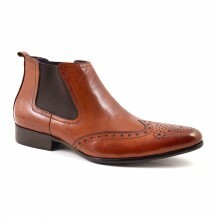 The toe length is pointed and elegant and there is brogue detail in the form of a wing tip and a medallion. Although the perforations and brogue detailing is all decorative now, there was once purpose to it. The reason for this in the beginning was to get rid of water from the boots of men working in the wet fields of Ireland and Scotland. That is why holes were punched into the untanned hide of these high ankled lace up shoes. Slowly, they became acceptable to wear as walking shoes but now they can be worn interchangeably with, for example, brogue shoes. The silhouette of this mens lace-up boot really lends itself to looking comfortable with a slimline suit, especially as it has a pointed toe. Having said that, if you wanted to wear denim with them, that would look cool too. Lets not forget how much warmer mens boots are for the winter season than shoes as a little warmth and protection from the elements around the ankle goes a long way. 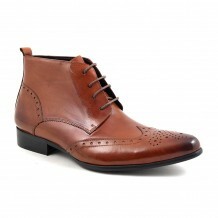 The leather on these dapper mens brogue boots is highly burnished so with a little care this can be maintained. Polishing and buffing would be good. Definitely spray these pointy brogues with a protector over the colder seasons and here is a top tip: if the boots get wet, shove some paper in them and that will absorb the water and maintain the shape of the boot. 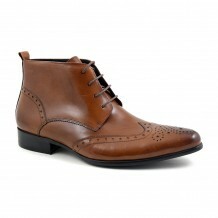 Voila, you will have a really cool mens black lace-up brogue boot to create various looks with. Be the first to review “Edris Black Brogue Lace-up” Click here to cancel reply.